There is a perfect phrase to describe a motorcycle with an unbeatable combination of performance, style and value. Equally ready for a daily commute, a weekend ride with friends or a long holiday getaway across the border. Designed to deliver riding comfort, excellent throttle response, seemingly effortless highway cruising and, above all, fun. Complete with fine quality and elegant style. To the dedicated team of Suzuki engineers entrusted with making the wildly popular Bandit 650 even better, it is more than a catch phrase. It is no less than a motorcycling mission, a professional calling, a way to make two-wheeled dreams a reality for more riders. Introducing the 2007 Suzuki Bandit 650 and Bandit 650S. Giving riders a choice, with fairing, or without. With optional digital ABS, or without. Built to deliver Total Balance. offering broad, responsive, smooth power and torque. drive) engine well-exposed for ready admiration. injection system effectively enhances smoothness of power delivery. at high rpm, and narrow-valve-angle design for better breathing. idle and improves cold starting. designed for an easy clutch-lever pull. wheel speed, and matches stopping power to available traction. with the fuel tank and other body parts. travel and adjustable damping and spring preload. and clock, and LED indicator lamps. 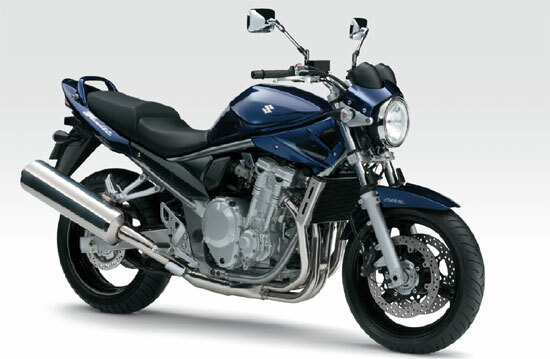 Specifications, appearances, equipments, colors, materials and other items of “SUZUKI” products shown on this catalogue are subject to change by manufacturers at any time without notice and they may vary depending on local conditions or requirements. Some models are not available in some territories. Each model might be discontinued without notice. Please inquire at your local dealer for details of any such changes. Actual body color might differ from the colors in this catalogue. Always wear a helmet, eye protection and protective clothing. Enjoy riding safely.